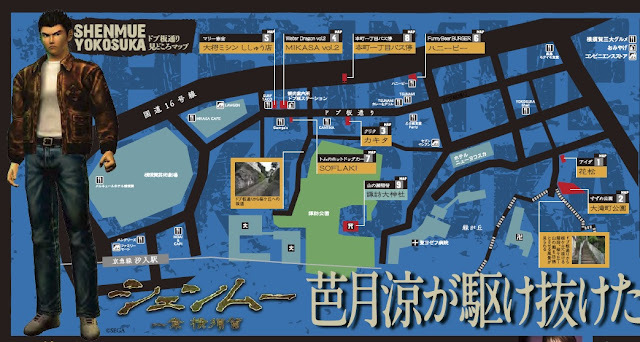 The Shenmue "Sacred Spot" Guide Map that was recently announced as a collaboration between Yokosuka City and SEGA, is now available. 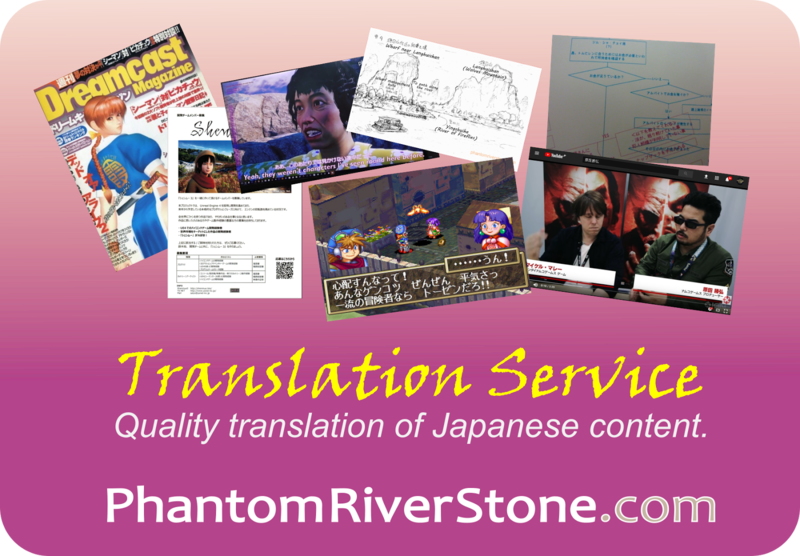 This initial version is in Japanese, and according to the CocoYoko tourism page, an English version is in progress (no estimate of its completion is given). The length of the print run for the Shenmue map is not given. The guide is in the form of a double-sided, folded pamphlet, densely packed with maps, illustrations, photos and shop information, all strongly tied to Shenmue. Florist Hanamatsu: the guide maps are outside the shop on the stand at the right. I was very excited to see the contents of this guide, as the topic of how the game reflects real-life locations and features is a theme of many of this blog's posts. My personal initial impressions are very positive. It would have been easy to simply take an existing generic map and illustrated it with Shenmue characters, but this is not the case; instead it is clear that care has been taken in collating the content. 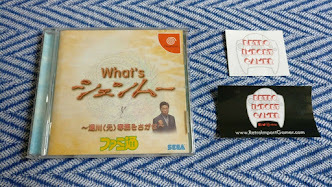 I can sense close involvement by Sega in providing specific information about which locations or shops certain parts of the first game were based. There are two main maps. One map shows a close-up of the Dobuita area, on which are highlighted locations that inspired those in Shenmue, such as the "Honcho-1-chome" bus-stop from where Ryo catches the bus to the harbor; various shops along Dobuita street (one of which has now closed) and a narrow staircase leading to a housing area similar to the one near Suzume Park. Map of the Dobuita area with shops and locations that have a connection to Shenmue. The second map highlights the route that Ryo travels between Dobuita and the harbor. Map of Yokosuka showing the route Ryo follows from Dobuita (on the right) to the harbor (at the left). Beneath the maps are small comparison photos that show the similarities of each location with the game. It would have been nice if these could have been larger for better clarity, but obviously with a free map space is at a premium. 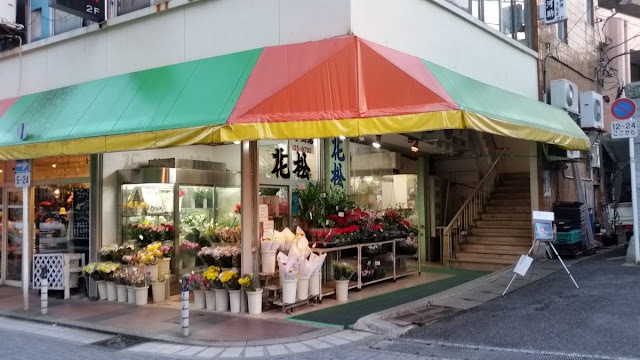 Finally, there is also a section covering historical photos of the Yokosuka area, with a brief comment on shops and features from the game are no longer present today. This second map, showing the harbor route, is of particular interest to me. Regular readers will be aware of our recently-published series of posts with analysis and theories on this topic here on the blog, so it is exciting to have the opportunity to get confirmation on the "official" route. Our next post in the Amihama series will explore this! Hm, I'm keeping my expectations in check regarding whether SEGA would announce anything at PSX (but you never know! ), but none-the-less there's they seem to have been stepping up their support for the game recently. 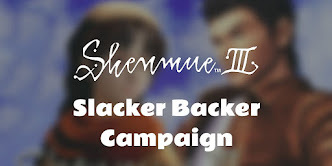 Absolutely, with the interest that Shenmue III has stirred up the timing makes sense for the first two games to be re-released for modern systems. I'm going down to Tokyo in early January. Maybe time to make a Shenmue trip to Yokosuka. The publication of this new map (and an English version in the future) makes a great excuse to head down there!